PrintOnKey is the name of an annoying browser extension that our researchers have classified as adware. The extension does not perform any useful functions that would benefit the user, so we recommend that everyone remove it. All the program does is show irritating and aggressive commercial advertisements. In addition, it is known to gather information regarding the user’s browsing preferences. In our opinion, this is unacceptable and should not be tolerated. Therefore, it would be best if you remove this malicious application and install an application that would protect your computer from similar infections further down the line. PrintOnKey displays sponsored links in the form of pop-up ads, coupons, banner ads, in-texts, and so on. Some adware applications mark their ads with a text referring to the program. All PrintOnKey should be marked with an “Ads by PrintOnKey” label. The ads are quite large and they are mostly displayed on online shopping websites, such as Ebay.com, Walmart.com, and a few others. You should not confuse legitimate offers presented on the website with ads by this adware, because the application is not legally associated with the retailers. Chances are that you will be shown misleading advertisements that will redirect you to unreliable websites that can be malicious. There is no way of knowing if the application’s developers are associated with any third parties. But we assume that PrintOnKey could promote some third-party links. On top of that, this adware app can gather information about you. Allegedly this is done to enhance your browsing experience, but we have heard this tale before. In the world of marketing nothing is sacred, so when advertisers claim that they want to enhance your shopping experience, they mean that they want to make more money. This program is not your average browser extension. It does not have a user interface, because it works as an executable that runs in the background, and is out of sight. You can find it after opening the Task Manager. Look for a process called Printonkey.exe. If you have it, then your computer is definitely infected, because this process will not be there otherwise. To our knowledge, PrintOnKey is disseminated using malicious software bundles. In short, malicious software bundles only contain bad software that can damage your computer to some degree. Most malicious bundles are made of adware applications, browser hijackers, and malicious toolbars, so it is possible that you will find this infection among them. This is the only means of distribution we know of; there is no indication that the application has a download website that is common these days, but, of course, that is a good thing. This is all the information we have managed to gather about this application. Our research proves that the application is malicious, because it is not associated with the retailers it sponsors, though it can be associated with third parties who promote unreliable content. Furthermore, the app has the ability to gather information about your browsing preferences, so there is no reason to keep this infection. You can remove PrintOnKey using the instructions provided below. 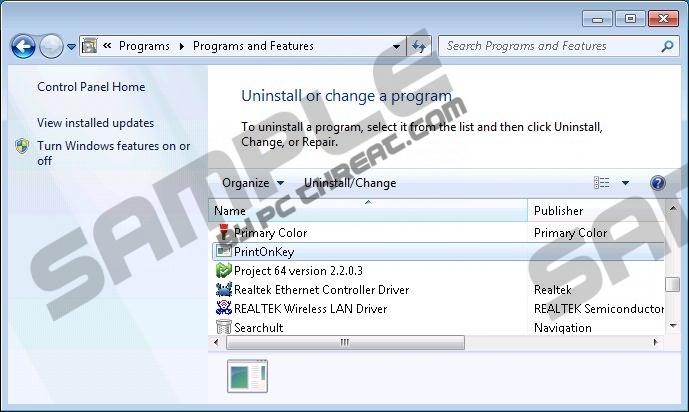 Locate PrintOnKey and click Uninstall. Locate PrintOnKey and click Remove. Quick & tested solution for PrintOnKey removal.